With built-in approvals and workflows, the Purchasing module in Deltek Vision safeguards against inaccurate or inefficient purchases in a paperless environment. Whether simple or complex, a company’s entire requisition, purchasing and receiving cycle can be run by Deltek Vision Purchasing while maintaining complete integration with the Financial Accounting, Project Management, and Resource Planning Vision modules. Thanks to the built-in workflows and approval processes, all purchases are accurately tracked using the Purchasing module. The Purchasing module of Deltek Vision allows project-based firms to manage the purchasing cycle, from RFQs to receiving and voucher entry. This paperless purchasing environment is secure due to the management defined user access and is easily maintained. Full integration with other Vision modules such as Accounting, Project Reporting, Billing, and Project Planning provides data consistency and communication throughout all parts of Vision. 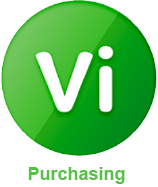 Finally, accurate purchasing reports are guaranteed using Deltek Vision Purchasing.